Mine Creek Battlefield presents exhibits in the visitor center along with interpretive exhibits on the battlefield. 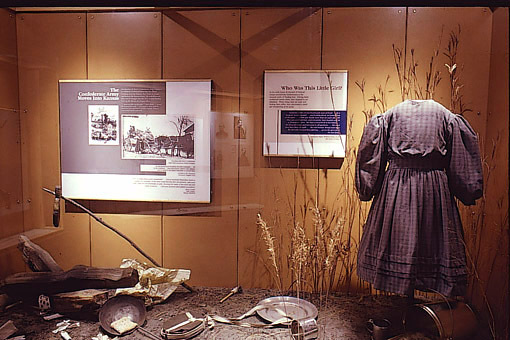 The visitor center tells the story of the Civil War in the West and the significance of the Battle of Mine Creek. A bank of windows that overlooks the battlefield allows visitors to contemplate the events of October 25, 1864, or simply catch a glimpse of wildlife. Explore the 2.6-mile walking trail which winds through the battlefield and features interpretive signs about the Battle of Mine Creek.